He is the son of farmers, but some two decades ago when the 20 something Gurdas Maan burst into the music scene with his block buster “Dil Da Mamla Hai,” he mesmerized the entire nation and hasn’t looked back. Today the legendary singer, actor and musician is global Punjabi star, who has made Punjab’s music and Punjabi films an international phenomenon. He has 29 hit albums, several movies roles in Punjabi and Hindi, a national award, Jury’s choice for best actor in his heart breaking film Des Hoya Pardes under his belt. 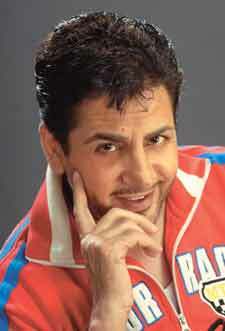 In an exclusive interview with Little India, Gurdaas Maan, who still looks as youthful as he did 20 years ago, (he did cartwheels on stage at the Sikh American Society of Georgia’s Vaisakhi concert) talks about his journey and why the music of Punjab is such a global draw. The first rays of the rising sun, the melody of bangles jingling as two voices sang in unison. The voices, the sound of the bangles belonged to my paternal grandmother and my mother as they sat churning milk in the morning. Those melodies, the spirituality that surrounded them, the music it created, became deeply embedded in my psyche and today it manifests itself through my music. I don’t belong to a musical family, but music was an intrinsic part of my life. As a child, I would take this little clay pot, pierce a hole through it, then take a stick and put that through the hole. Then I would sneak up to the window and extract one long thin wire from the meshed wire covers we used to protect our windows, from mosquitoes and flies, and attach that wire like a string across the stick. I would then pretend it was an ek tara (a single wire string instrument) and sing along strumming away to the best of my ability. I used to be doing this and trying to hide it from my grandmother, who was worried my obsession with music would take me away from studies. So what were the early musical influences then? Not many really. We were only allowed to watch movies very rarely as a treat. If I did well in school, I would occasionally be told, go watch a movie. I never even got to hear Hindi songs so my exposure to music legends like Mohammed Rafi, Lataji, Ashaji came much later. Nor did I get any training in music. I’m completely self taught. So the musical influences were the folk songs and dances of Punjab, the wandering singers, beggars, Sufis who trod the path to my village. Soon however radio introduced musical programs and I began listening to Radio Jullundur and Radio Pakistan, and became familiar with well known singers like Surinder Kaur, Asa Singh Mastana, Shaukat Ali. the famous Pakistani ghazal singer Ghulam Ali too, had just started his career then. Sufiana music attracted me from the beginning, may be because I am a Sufi at heart. My lyrics, my music are deeply connected to my spirit, my soul and life’s experiences and I draw on them extensively to create my songs. Interestingly, often every one, including the extended family, would sit around the open area where my mother would be cooking on a clay oven, around dinner time and conversations would revolve around poetry and recitation of verses. We would often discuss the famous poet Waris Shah who wrote Heer, and other stories. We would be given turns to continue the stories and my mother or grandmother sang when they cooked. The tales remained deeply etched in my mind, some I remember so clearly to this day. I would sing at weddings, and other events. Microphones and loud speakers had just come into our village and my grandfather would take me to a wedding all dressed up in my finery and say, “Gurdas go up and sing” and be thrilled to hear my voice. My grand mother however was concerned that I may get distracted. I was passionate about two things-sports that I excelled in and music that I loved. I was never really into studying. You actually ended up in Patiala at the National Sports Institute and won many medals including a masters in Physical Education and a black belt in judo. That was quite a detour from music. I think that physical fitness has helped me in continuing the extremely physical routine I perform on stage to this day. I had actually started participating in plays and would compose my own lyrics and songs. It was while working with the legendary theater personality Harpal Tiwana that I also saw actor Om Puri and met Raj Babbar. I used to watch them. I wanted to do plays and I was introduced to him through a librarian who was also his secretary. It was when I wrote ‘Dil da Mamla’ that Sardarji Bawa, the theater and TV personality, saw me perform it and decided to shoot me singing that song for Doordarshan. I said I don’t think I can do it. It was nerve racking. I initially thought they were pulling my leg. They said don’t worry, this is just a rehearsal. I went on stage and all the crew became my audience and so I started to sing. That so-called rehearsal actually ended up being the final shot and was broadcast on Doordarshan. It became an overnight success and we were flooded with letters from all over the country and even Pakistan asking to get me back on the television stage and that was followed by Bekadran naal yari, which became another hit and it has gone well from there. 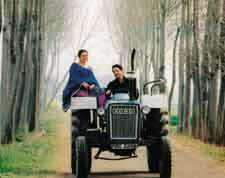 You have made some very thought provoking Punjabi films-Shaheed-e-Mohabbat and Des Hoya Pardes. Both movies were huge hits and you walked away with the Jury’s choice national award for best actor in the latter film. Shaheed-e Mohabbat lay in cans for six months as there were no distributors. The Punjab film industry is still a fledgling and may be that is why it still remains pure and unadulterated by commercialism and the sleaze that has filtered in to other industries. When we did find distributors it became a major hit and the Hindi film Gadar is inspired by it. Des Hoya Pardes is based on a true story. I was in Patiala when Indira Gandhi was assassinated. The police station where you see me being tortured, the police, it was all real. It was very difficult to do those scenes knowing they have happened in real life. The fact that the cops were real cops, the police station was the actual one where those atrocities had been committed made it even more real. Many times people would be in tears. When you emote from the heart, the impact is immediate and I felt as if I was that man, on whose life the film had been based. The movie has been appreciated deeply wherever it has been shown. I had been asked by the government to surround myself with security, but I have this firm belief that when its your time to go, you will go no matter how hard you try to save yourself. If the prime minister of a country could not save herself and she had access to the best security, who was I to stress out so much. Also I have this inherent faith in the goodness of people. Those who are secular and humanitarians will remain so no matter what, and those who aren’t don’t need any excuse to commit atrocities. Many a time at the height of the turbulence, my car was stopped, but the cops would see me and immediately let me go. You have now ventured into Hindi films with Zindagi Khubsoorat Hai – yet another touching story revolving around an autistic child with Tabu, the well known actress from Bollywood. The story was again inspired by a child I met in London. He cannot speak and is in a wheelchair but he listens to all my songs. I was performing and he saw me and reached over and hugged me. I then saw him lip-synching every one of my numbers. It moved me deeply. Other than that the movie was a bitter experience for me personally. We moved to Bombay to be part of the Bollywood industry. I’m neither comfortable there, nor am I comfortable speaking Hindi. I told my wife not to produce it, that I would prefer to make the movie in Punjabi, but she felt it would reach a wider audience. Somehow whenever I have a get feeling about something I’m right. The movie was just so scattered in the way it was made. Anything that has been made against my wishes even if it does well and is well appreciated, still remains a bitter experience for me. How have you seen the audience and Punjabi music change over the years and what do you think of all the Punjabi fusion, remixes that are going around? I have been traveling and performing abroad for over two decades and I hrefuse to be anything but a solo performer. Initially the audience was a bit scattered, but today I see thousands of people jamming places like Madison Square Garden and many other large auditoriums that I have performed in. I have received so much love nationally and internationally and that continues to this day. I think the music companies are right now totally obsessed with what sells and then create music to suit that. It doesn’t happen with me, because my own company makes the album. I know that many people don’t like fusion and remixes, but I feel that this has really put Punjabi music on the international map. The fragrance and beauty of Punjab’s folk music will always permeate through, no matter what genre you present it in. Today I have also given a new dimension to my old songs by modernizing the instrumentation. So my evergreen songs like “Challa,” “Dil Saaf Hona Chahida,” “Mamla Gadbad Hai” and “Dil da Mamla Hai,” to name a few, all sound new and fresh. Your latest album Vilayatan has become a blockbuster since its release a few months ago. It has an interesting mix of songs. Yes people especially love the title track, where I have talked about the loneliness many women feel when they are uprooted from their homes and married abroad. I never sit ceremoniously to compose songs. The thoughts come suddenly when I see something, feel something and Vilayatan is also the result of living life.What is in the works now and how do you stay so grounded and untouched by materialism? I’m doing the title role of the movie Waris Shah: Ishq da Waris based on the life of the Sufi saint and poet Waris Shah and this is a huge milestone for me. I have been consumed by the poetry of Waris Shah since I was in high school. His work is a holy book for me. I knew that I will somehow be involved in something to do with Waris Shah, but never in my wildest dreams did I think I would have the good fortune of playing him. It has been a deeply spiritual experience to say the least. Each time I get into the costume and am on the sets I feel as if his spirit has entered my body. The main legacy my parents have given me is the legacy of humility, patience and gratitude to the Almighty who has blessed me with so much. I firmly believe that if you don’t possess these values, you will not go very far. For me the ultimate measure of a man’s success is not by what he has achieved, but by his humanity. Life has to be lived from the heart, because it’s the mind, the brain that becomes tarnished by materialism, greed and manipulation. I think as long as I continue to think with my heart, the ground won’t be too far from my feet.